Winter is the season when we can feel the most vulnerable, insecure, and lacking in motivation. Foods that can make us feel supported, warm, and secure are buckwheat, oats, soba noodles, miso soup, adzuki beans, roots, greens, and salty condiments. By adding the above foods to your diet, you’ll feel more self-confident and less stressed, retain your sense of humour, and have a greater sense of balance and stability. With the seasonal change from autumn to winter, we tend towards longer cooking methods, that include stronger soups, sautéed vegetables, casseroles, and baked dishes. A little more oil, seasoning, condiments like gomasio, and sea salt (only used in cooking) are appropriate as they warm the body. Vegetables are cut into larger chunks for longer cooking, while buckwheat, along with fried rice and soba noodles are the grains most appropriate at this time. Shiatsu can be used to offer symptomatic relief from a number of ailments as well serving as a means for maintaining your general health and wellbeing. 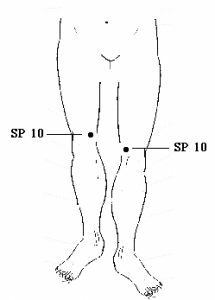 Spleen Meridian Point 10 (SP 10) is located 4cm inside top corner of knee. It can be used for symptomatic relief of anaemia. Using either your thumb or middle finger, apply pressure until you feel the soreness in the point. Taking deep breaths and maintaining the pressure breathe slowly in and out of the point until you feel the soreness and tension disappear. Slice carrot, dice onion and stir fry in sesame oil until golden brown. Dry roast buckwheat flour, and mix in with wholemeal flour, arrowroot, and water in a large bowl. Add tamari, stir fried carrot and onion, and let sit for 20 minutes. Meanwhile, wash and cut broccoli and bok choy add to saucepan and steam until soft. Shred nori sheets adding to pancake mix which becomes thick. Coat fry pan with sesame oil and heat pan on medium flame. Spread 2 ladles pancake mix evenly into pan and let cook for a few minutes until brown on bottom. Turn over with spatula and cook other side. Stack on plate. Serve with steamed broccoli and bok choy on top. This pose builds up strength in the legs, straightens the spine and supports the back. Legs apart, left foot at 90 degrees, right foot at 45 degrees. Bend left leg at the knee keeping the knee in line with the heel. Try and keep the hips facing the bent knee, and weight on the straight leg. Bring the hands into a prayer pose, and on the inhale raise the arms up above the head, with palms facing forward. Remain in the pose for 3 breaths, then exhale and lower the arms. Change legs and repeat on other side. Beech can be helpful for intolerance. General dosage is 4-5 drops under the tongue at least 3 times a day or whenever feeling intolerant.